Carnival Cruise Line launched its first-ever gift card program on December 5th, 2012. What is the Carnival Gift Card? The Carnival Gift Card is a pre-paid gift card similar to a gift certificate that can be used as payment toward a cruise booking on any of our ships, online pre-purchases of shore excursions, spa experiences and Fun Shop gifts or toward your Sail & Sign® onboard account. Gift Cards are not accepted on ships that sail with a functional onboard currency other than USD; therefore, Gift Cards will not be redeemable (or sold) on board Carnival Spirit, Carnival Splendor or Carnival Legend while operating in Australia as the functional onboard currency is AUD. 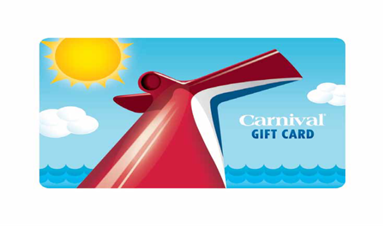 Carnival Gift Cards may be purchased online at carnival.ourgiftcards.com, on board our fleet or at approximately 9,000 retail locations. The gift card may be redeemed on Carnival.com, GoCCL.com, by calling Carnival (1-800-CARNIVAL) or on board. It is more convenient than cash or a paper gift certificate. Please note - As of November 15, 2016, all Carnival Gift Cards require a PIN number. The PIN number is located either on the back of the card under a scratch off or sent in separate email for redemption. To see Carnival Gift Card FAQs, please click here. Guests calling the contact center for information or to make a purchase will need to be directed to the program website. The company managing the gift card program will provide assistance to guests with any questions. Travel Agents will continue to earn commission for the sale of the cruise when it is paid with a gift card. The Carnival Gift Card is just a form of payment for the cruise booking. Travel Agents will not earn commission when they buy or sell Carnival Gift Cards to their clients. Gift Card Fraud: Should any guests contact you indicating they have purchased a gift card from a third party, please explain that this is against our policy and do not proceed with the transaction. Guests who are victimized by this fraud should be directed to their local police department to file a complaint.